The fuel-cell maker keeps promising to be better, but it's fallen short every time. Why should this year -- or next year -- be any different? 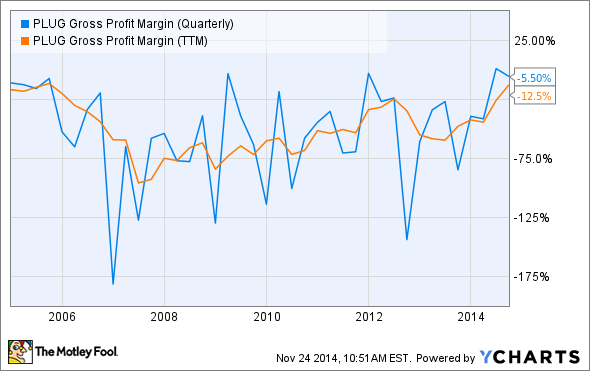 PLUG Gross Profit Margin (Quarterly) data by YCharts. Eagle-eyed investors will zoom in on the company's most recent results as cause for optimism. A negative 12.5% gross margin over the past four quarters is pretty ugly, but it's actually the closest Plug Power has come to a positive gross margin on a trailing 12-month basis in the past decade. The company even posted a positive quarterly gross margin in the second quarter, which hasn't happened for more than a decade. Things are expected to look better in 2015, according to Plug Power CEO Andrew Marsh, who mentioned in his company's last earnings call that he expects product gross margin to continue improving until it reaches 25% (spending $0.75 to make a dollar) at the end of 2015. Marsh also said gross margin from the company's service offerings should hit 10% by the end of 2015. "[D]uring this year , we're flipping to where we start making money when we ship units ... at least half of our submittals from a dollar point of view were actually associated with products that build systems at customer facilities, which should generate gross margin positive numbers for Plug Power." -- Andrew Marsh, fourth-quarter 2008 earnings call. "I would now like to reiterate Plug Power's 2010 milestones. First, Plug Power will dramatically increase unit shipments for the year, shipping between 2,100 and 2,300 systems ... consistent with these shipments, Plug Power will generate between mid-$40 and low-$50 million in revenue. Plug Power will [also] achieve a gross margin percentage in the mid-teens." -- Andrew Marsh, fourth-quarter 2009 earnings call. "Plug Power expects margins to top 20% in 2012, and reach 30% in 2013. ... Every unit we ship today has a $6,000 fixed load associated on a per-unit basis, because our volumes are so low. By the time we reach shipments of 4,000 units a year, we reduce that fixed load by 75%. And at that point, our margins will just naturally grow every time we ship a unit." -- Andrew Marsh, first-quarter 2011 earnings call. "In 2012, we expect product and service gross margins to be 10% as compared to the 20% gross margins we had previously projected for the year. Approximately 40% of this gap is due to the impact of fewer shipments than we previously projected ... 10% of the gap is related to a higher mix of old product designs that will consume existing inventory by May of 2012, and approximately 50% of this gap is linked to our pricing." -- Andrew Marsh, fourth-quarter 2011 earnings call. "I expect the gross margin for products in 2014 will be above 25%." -- Andrew Marsh, fourth-quarter 2013 earnings call. How did that pan out? Plug Power's gross margins was negative 60% in 2009, negative 51% in 2010, negative 55% in 2012, and negative 42% in 2013. Tightening its focus to only the gross margin on product sales has helped Plug Power creep closer to hitting its target this year, but through the first three quarters of 2012 its product gross margin was only 12%, half as much as hoped for by year-end. Is a 25% gross margin possible? Sure, but it's unlikely. Plug Power is targeting full-year revenue in the range of $70 million to $75 million; through three quarters, it earned $42.8 million, with product sales accounting for two-thirds of that revenue. Let's use the midpoint of Plug Power's guidance as our target. To hit 25% gross margin on its product sales for the full year, Plug Power would need to sell $20.3 million worth of products in the fourth quarter, and reach a gross margin of 45% on those sales. Plug Power has never done this before in any quarter of its publicly traded existence, and it would far exceed what it now hopes to reach next year for product margin. In fact, the closest Plug Power has come to this sort of margin was during the early part of this century, when it enjoyed three quarters (fourth-quarter 2000, first-quarter 2002, and first-quarter 2003) in which overall gross margins surpassed 25%. However, deeply unprofitable operations for the remainder of those fiscal years kept trailing 12-month gross margins deep in the red. Plug Power expects in the fourth quarter to ship 900-1,000 units out of a backlog of 2,534 units, which would be roughly 100 more units than it shipped in the third quarter. Given the numbers -- the company recognized revenue on 835 units out of 857 shipped in the third quarter, and recorded $12.6 million in revenue -- it seems simply impossible for Plug Power to come even close to hitting its fourth-quarter targets for either product revenue or gross margin. Sales of another 100 units would only add $1.5 million to the top line at a rough third-quarter price of $15,100 per unit. That would leave the company with a $6.2 million gap between expectations and reality, to say nothing of the fact that $1.5 million in pure profit still wouldn't come close to getting Plug Power to its full-year target of 25% in product gross margins. Looking further into the future, investors should be somewhat concerned that Plug Power's backlog is now rapidly shrinking, from over 3,700 fuel-cell units at the end of the first quarter to about 2,500 at the end of the third. Since Plug Power has shipped 1,709 units this year, the difference means it has probably only taken orders for about 500 units since the massive 1,738-unit order from Wal-Mart (NYSE:WMT) that sent its shares surging in February. And 286 of those new orders are also from Wal-Mart. Moving another 950 units out the door will bring Plug Power's backlog near where it stood before Wal-Mart came along, and no one else seems quite as interested in deploying Plug Power's units at anything close to the same scale. How can Plug Power possibly reach 25% gross margin next year without significant new orders? It will ship roughly 2,650 units this year, so barring any surprises it is set to enter 2015 with only 300 more units on backlog than it ended with in 2012, a year in which it shipped only 918 units. Plug Power has a well-documented history of setting highly optimistic targets and then failing miserably to reach them. Its current projections seem no different. Investors chased Wal-Mart's order into the stock this winter, only to realize that one big buy doesn't equal a great business. With nothing of similar size on the horizon, is there any real reason to be optimistic about Plug Power today?